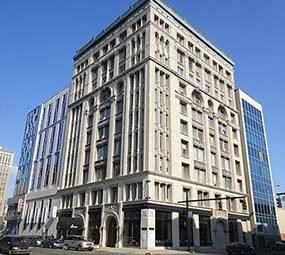 This historic 10-story building is located at the corner of Maryland Street and Pennsylvania Avenue in downtown Indianapolis’ Wholesale Cultural District. The building includes a premier steak restaurant on the ground floor, a fitness center on the second floor, and eight floors of class A commercial office space. The exterior design for the Majestic uses the strength of the Romanesque Revival style. The large entrance arches are decorated with foliate and acanthus carvings. The three massive arches in the upper stories give the building its monumental character.